Add brilliance to any attire with a stunning pair of stud earrings. With a vast selection of cuts to choose from, you’ll be sure to find the right pair on our website. CaratsDirect2U has a very large collection of simple stud earrings that go perfectly with that everyday look that your wife loves but wants to spice up a bit. Stud earrings also make a great gift for birthdays or anniversaries and even just to show that special someone just how much you care. We have many different size and shapes of stud earrings available right now for you to choose from in shapes such as round, emerald, marquise, oval, pear, princess and radiant. 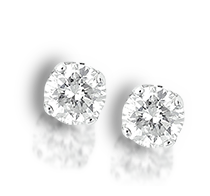 They range in size from half a carat to almost 5 carats in weight. All of our stud earrings are mounted in either 14k white gold or 14k yellow gold. We also offer treated stones that have the same fire and shine as non-treated stones but for a fraction of the price.